In researching those past members of RBGE staff who enlisted and were killed during the First World War I’m aware of all those who enlisted and survived the war, having served their time in the trenches – those that never received a mention on any war memorial but tolerated many of the same experiences including the fear, pain and discomfort we so often associate with trench warfare. Ironically, it can be these survivors that can be harder to research, but an opportunity to look at one of them, John Richard Ferisy, arose recently when he became the subject of an enquiry sent to the library at RBGE. The enquirer was a medal collector who had come across a couple of medals with Ferisy’s name (or his ‘alias’ Ferguson) inscribed on them. During his research he discovered that Ferisy had worked at RBGE as a timekeeper and so he asked if we had any more information about him. 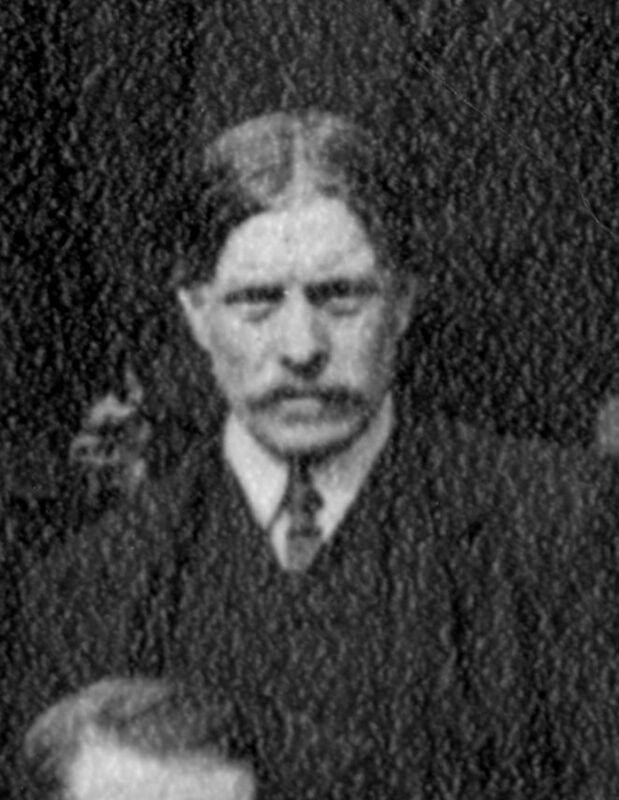 Research in July 2018 has indicated that this may be Ferisy, amongst RBGE staff in a portrait taken in March 1922. John Richard Ferisy was born on the 27th February 1869 in Edinburgh. His parents were Sophia (née Watson) and William Ferisy, who was a gardener, and he was brought up with his brothers and sisters in a small thatched farm cottage called Forest Hall just north of Craiglockhart in the parish of Colinton. Ferisy’s military records tell us that he joined the army, specifically the 2nd battalion of the King’s Own Scottish Borderers (KOSB) in 1889 at the age of 19 (which calls into dispute either the age he gave when he joined up or his birthdate, but only by one year), stating he was a mason prior to this. He was involved in the 1895 ‘Relief of Chitral’ campaign on India’s northwest frontier and was therefore awarded the 1895-98 India General Service Medal; our medal collector has obtained this medal, but not the Queens South Africa medal that he also would have been entitled to when he was recalled from the reserves four years later to serve in South Africa with the 1st Battalion KOSB during the 2nd Boer War between 1899 and 1902. Ferisy joined RBGE in December 1913 as a labourer, but re-joined the army again on the 28th August 1914 when the First World War began, initially with the 6th Battalion KOSB and then the Cameronians (Scottish Rifles) with the latter service in India, thus sparing him the horrors of the trenches towards the end of the war. His South Africa and WW1 medals are yet to be located and our collector would love to re-unite them. The next time Ferisy gets a mention in the RBGE Guild Journal (apart from his appearances in the Guild member lists, the RBGE Guild being a society of past and present members of staff, allowing everyone to remain in touch) is when he dies: “Obituaries… John Ferisy, Edinburgh, in April 1939”. He would have been 70. He does however receive further mentions, in the early 1980s, when past members of staff were asked to recall their memories of working at RBGE for inclusion in the Guild newsletter. 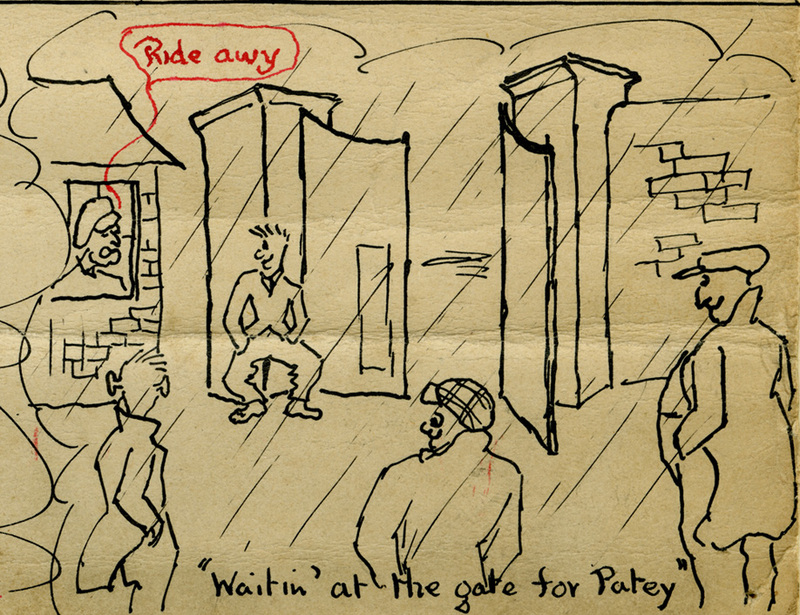 Cartoon drawn by Jock Scott in 1936 showing Patey at the gate – he was Ferisy’s successor. His name doesn’t appear on any memorial here, but I like to think that thanks to email enquiries, researchers, information gleaned form historic records and outlets such as Botanics Stories we can remember men like him.